Solar Site Services (a service of The Energy Advisor ) provides solar site surveys and consulting for consumers, public and private, contemplating the purchase of solar electric systems. In addition, Solar Advisory Services are provided to demystify and facilitate the solar buying process to achieve the best available economic selection of solar installation vendor, product, price and warranty. Why use Solar Site Services? You buy tomatoes for $ 3.00 at the market and then as you're pulling out the supermarket driveway you notice an open-air market has better looking tomatoes for $ 2.00. Rule 1: you didn't spend enough time to consider more alternatives... but you aren't too disappointed since 'what's a buck'? You buy a solar electric system for $ 50,000, after incentives, then receive a call from a vendor two weeks later that has excess install capacity and would have dealt for $ 40,000, and their warranties are better. Rule 2: those aren't tomatoes. A Solar Site Survey is performed at the prospective physical location of the potential buyer. 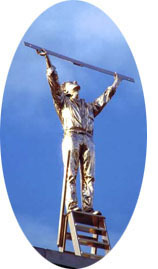 Various measurements are taken to determine where solar insolation can be maximized, taking account of various surfaces, their pitch angles from horizontal, and obstructions. 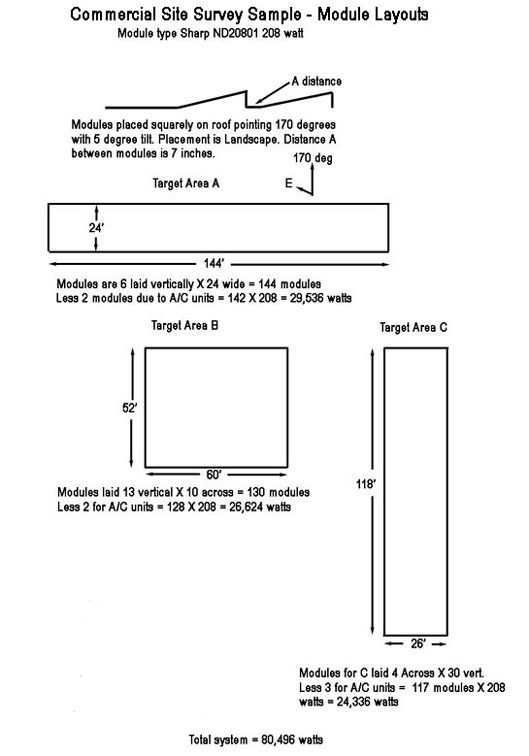 An "image based" approach is used to illustrate where the solar modules should be placed. These images and parameters can be used to inquire about price and delivery options from qualified solar installation vendors and/or for Do it Yourself consideration. An added feature is a Pro Forma illustration of solar system size showing anticipated energy generation in kWHRS. A narrative is included noting various financial subsidies from State and Federal sources that can effect both the system sizing and financial worthiness of the solar investment. The Site Survey results are primarily delivered in machine readable form via email attachments. This facilitates the client soliciting multiple installation vendor bids electronically. Importantly, each installation vendor will be proposing a solution on an 'apples to apples' basis so the client need not be faced with the problem of comparing a wild array of design configurations. Using the Solarsiteservices benchmark design, vendors will propose a spectrum of technologies, components and prices. Availability of solar product inventories, vendor backlog, and desireability of obtaining the solar job have significant impact on final price and installation lead time. Below are some sample outputs* delivered to the client after the Site Survey is completed. 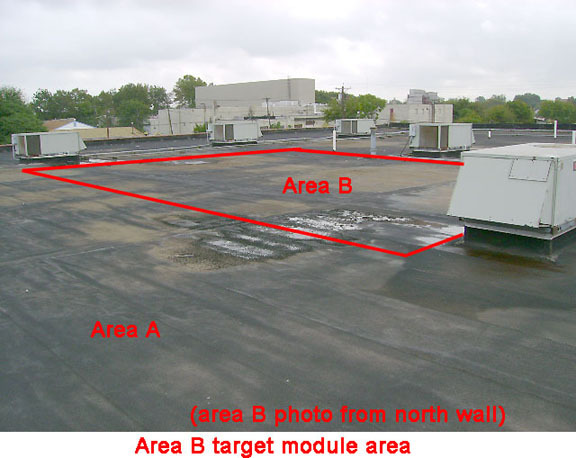 In 2009, the Solar Training Institute, San Jose, Ca., selected the 'Solarsiteservices' photoshop based approach to site survey presentation format (used in these samples) for their training courses in PV design. In many organizations, especially in the public sector, procurements for products or services are awarded to the lowest evaluated bid. Unless the product is a commodity and understood to be a commodity, lowest price is not always the best measure of cost. For example, buying a $ 100 tire with tread warranty for 80,000 miles is actually better than a $ 50 tire with a 25,000 mile warranty. Wherever there is complexity in a buying decision, numerous variables should be considered. Solar PV is one such case. There are numerous solar vendors in the marketplace. While most consumers would not commit to make a capital purchase receiving only one vendor's estimate, a complication is that soliciting proposals from multiple vendors will result in multiple system size configurations, varying price levels, multiple economic payoffs each with their own interpretation, small and large required deposits, friendly and unfriendly contract language, varying warranties, and different financing options, to name a few of the buying considerations in an evaluated review process. Solar Advisory Services assists the consumer decision making process by acting as an 'independent' liaison between the buyer and vendors. Being able to communicate in the language of the solar vendors with a better understanding of forecast variables and assumptions, will help a buyer to make an informed decision based on fact rather than vendor sales speak. 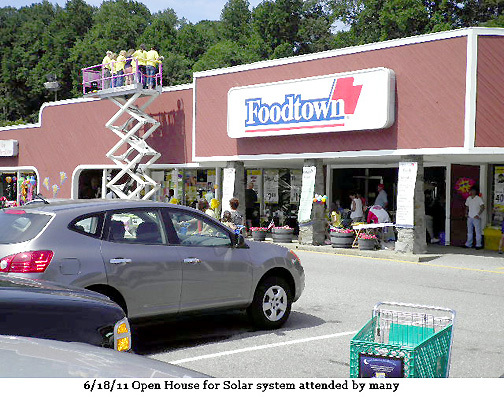 In many cases, buying a solar electric system at retail without State and Federal incentives to reduce the capital or generation costs is currently a poor value proposition and is likely to remain so in the short run. There are several exceptions including DIY systems which have good value even with limited financial subsidies but they require some installation skills, know-how in various Permit and Approving authority Codes and self-confidence in integrating a diversity of components. In the long run all solar cell/panel costs will continue their long term decrease (experience curve) as electric rates rise so what may not appear economically attractive for a buyer today inevitably will be cost effective at a future point. Lowest Evaluated Cost should be the key objective in a solar electric system buy. Lowest Evaluated Cost considers many factors like initial cost, product warranty, module and mounting type, time value of money to compare financial returns and financing considerations. In some cases, the best acquisition option may not be system ownership at all but a lease-like approach. There are also times when a buyer may want to pay more for their solar equipment than an apparent equivalent. Perhaps the modules need be on the front street facing roof and the consumer desires a more aesthetic appearance, at a price premium. Or perhaps, spatial area is limited so more productive premium priced solar modules might be more desirable to achieve greater power from limited space. In some case 'less' productive modules of a different technology might also make sense where there is an abundance of space. For example, film type panels are less efficient and cost less per watt but may have greater installation costs. Tradeoffs abound! Government subsidies are needed to make solar electric financially worthy.. the State of NJ, for example, has targeted a current dollar capital payback of about 10 years. What a buyer actually 'achieves' in payback terms leaves much to interpretation and assumption, however, since the benefits are all futures. As state and federal programs evolve, it may make sense to commit early to take advantage of a good subsidy program now since electric prices may rise while incentives decline. On the other hand, a new technology breakthrough might mean a decision delay makes more sense. These are risk analysis variables that will be addressed in an upcoming white paper. Richard Barbarics is a principle advisor and has over 25 years technical experience in the technical arena including application engineering at General Electric, systems development at Network Services Division of ADP, Management at Wang Labs and 4 years of solar site surveying and PV system design. He has performed over 300 site surveys and has his BS in Physics from Virginia Tech and MBA from Widener University. Kenneth Bolton is a principle advisor with over 25 years technical and management experience including General Electric and for the past twenty years as CEO for Management International, a provider of various environmental services for the public and private sectors. He is a Registered Professional Engineer in the State of New Jersey. Walter Behnke is a principle advisor with over 25 years technical and management experience including Honeywell and multiple startups. He is patent holder for a remotely monitored BAS (Building Automation System) (US # 7183899) currently being configured for solar tenant sub-metered applications. He is also a Principle with Global Gate Technologies and Energy Planning Solutions. Solar PV applications come in many sizes and configurations with NO generalized rules based on square footage. For example, a large home may have 'solar appropriate' roofs that have numerous dormers and gables, precluding an efficient solar design configuration. Likewise, large trees, that a buyer does not want to trim of remove, may cause substantial shading even when they are located in east or west directions relative to the 'solar appropriate' roof. Unshaded building flat roofs offer numerous possibilities for design, with varying investment economics and solar productivities. The following sampling of designs is indicative of before-after appearance. Onsite Solar Site Surveys are scheduled over a 10 day period. These are confirmed by email or telephone as to designated date and time. Time is given in a range of several hours. 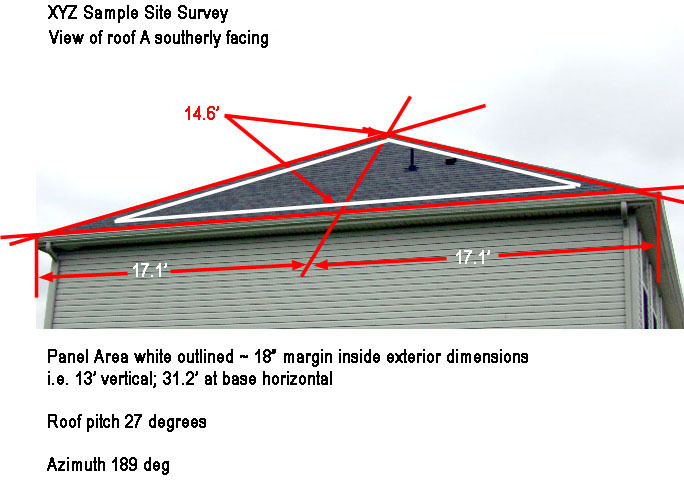 It is not necessary for the client to be onsite for the Survey Data Collection Phase but the client should be aware that the service provider may scale the roof to take appropriate measurements. Data Collection takes about one hour for residential surveys and longer for buildings, particularly with significant roof obstructions (A/C, vents, piping, etc). 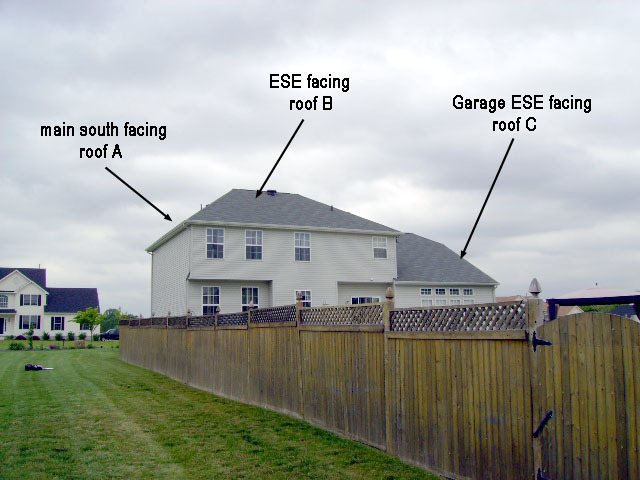 It is important for the client to pre-determine that there is a southerly or east/west solar exposure that is not shaded by trees or other nearby obstructions. 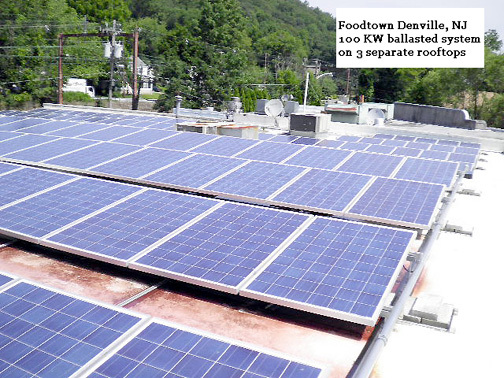 Solar arrays are not practical on north facing roof surfaces. 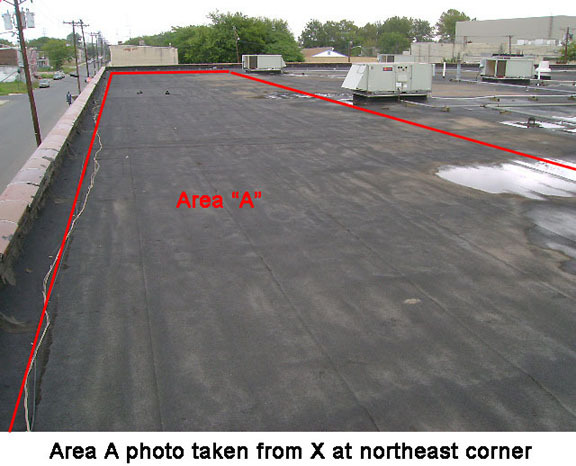 Relevant data is collected regarding surface dimensions, degrees pitch, true azimuth readings, roof assessment, meter(s) location, partial shading and other factors which will determine the potential for solar array placement and where. A client should indicate in advance to Solarsiteservices if 'groundmount' structures are viable. Usually groundmounts require large open areas; they are often not applicable to residential lots. If the residence is over 40 years old, the client should check or have the Solarsiteservices technician examine the electric distribution panel, usually in residential garages or basements, to insure there is one available 30 amp circuit breaker or space for one, for system connectivity. Likewise, for such older structures, a check should be made of roof rafter structure, noting rafter size ( e.g. 2X6 or 2x8) and approximate distance between rafters. 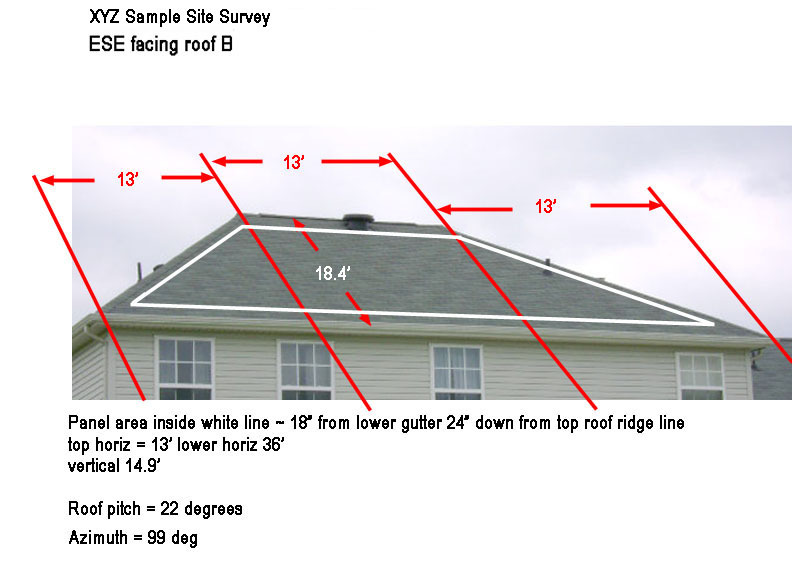 The data are analyzed and presented showing the applicable dimensioned roof sections for solar. This information can be used to directly source bids from numerous solar installation contractors. In addition, a pro forma solar installation design and financial estimate is provided to give the client a benchmark against which installation vendor proposals can compared. Site Survey fees are prepaid. 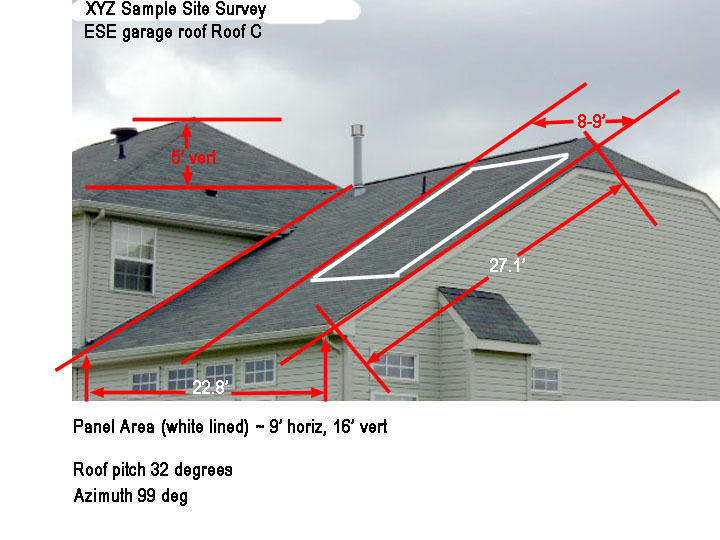 Survey results are emailed with attachment detail including roof segments, dimensioned areas, obstruction notation, pro forma layout and notes. For some solar installation vendors, this fee might be deducted from an installation vendor's bid. This is especially true if the install vendor is some distance away from the client site and would prefer bidding on a potential install via email or phone, based on the Solar Site Services survey. The client should ask if the vendor(s) will make a deduction for the survey. 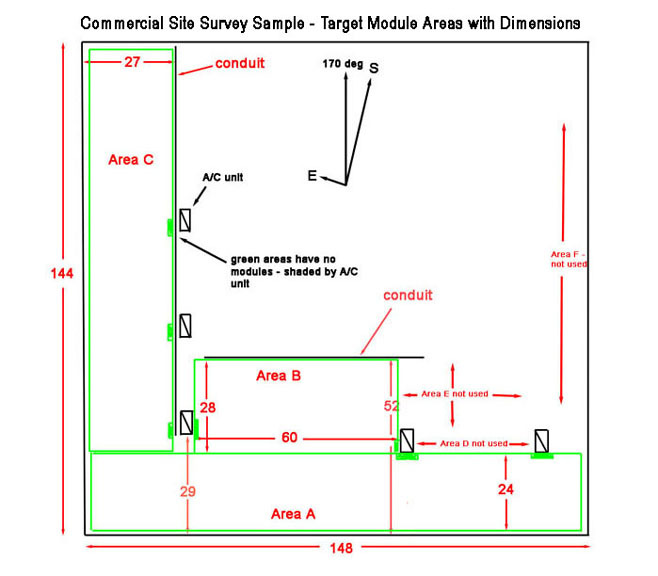 Sub-contracted solar site survey services are available to solar system integrators and/or installers. Please email for further information. Advisory Services facilitate the buying process for a solar PV system. Once a client has a solar site survey in hand, they may opt to work directly with any number of install vendors to obtain bids for a solar installation. Some clients may want to continue the relational process with a more turnkey approach to help select an installation vendor. Advisory Services will solicit proposals and pricing from a number of vendors, usually 3, and then perform an evaluated cost analysis to compare vendor proposals. A report with recommendations helps insure a client receives the best value for their expenditure.